This abundant little wading bird is found throughout the British Isles and breeds occasionally in Wales. Some are resident here, while others are transient visitors. Their plumage varies with the seasons. In winter, the upper parts are greyish, while in summer they take on a red-brown hue. You will see Dunlins on sandy shores and estuaries, mud flats and salt marshes. Occasionally they move inland to the lowland lakes and marshy moors. They generally build their grassy nests on moorland, and four is the usual number of eggs. 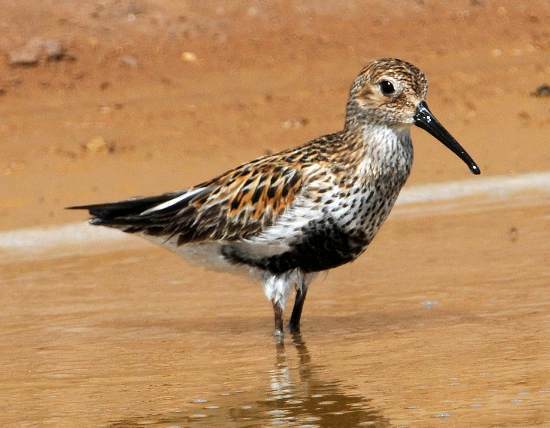 Insects, sandhoppers and small crustaceans feature in the diet of Dunlins.